This review for Rev. Schulte is long overdue, but even today, several months after our wedding, a guest commented on how fantastic our officiant was. He really exceeded our expectations and went way above and beyond the call of duty for us. We booked Rev. Schulte via email about a year in advance as we were planning a destination wedding. From the outset, he was responsive to both email and phone. His website and blog were incredibly helpful, and he always had advice about practical wedding details, including which Savannah squares were best for our outdoor ceremony and what other vendors he recommended. 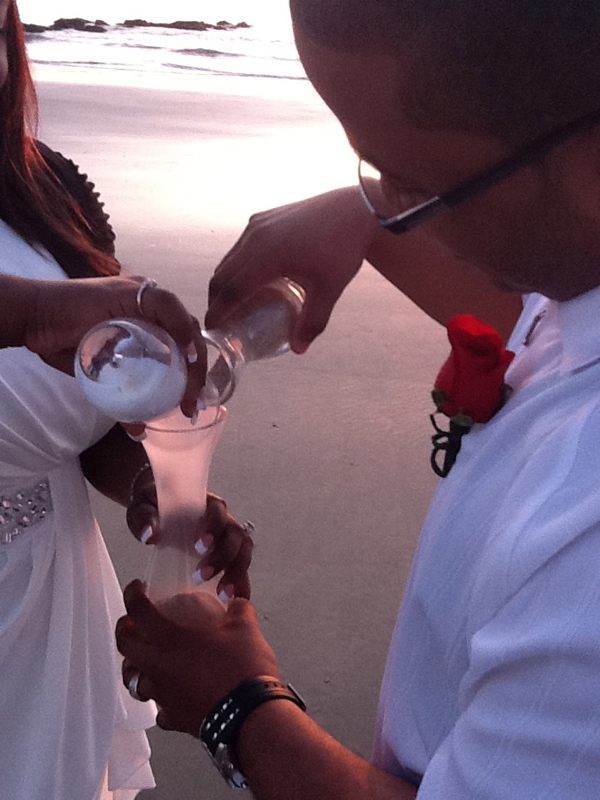 He also has several sample ceremonies, and was very open to any sort of customization that we wanted. We didn’t actually meet in person until two days before our wedding. We’d had quite a stressful week in Savannah (it included a trip to the ER for one of our family members), and I think Rev. Schulte could immediately tell that we were stressed. He was incredibly calming, and went over every detail of the ceremony with us over coffee. He really knows EVERYTHING – including the best places to stand in the square based on uneven pathway bricks, and which angles are better for photographers!! He then made the very generous offer of finding us a day of planner at a reasonable price- which he did almost immediately!!! He gave us the reminder that we needed at that moment, which was that our wedding was important and we were entitled to a special, perfect day! And it was, largely because of him. The day of, my father was so overwhelmed that he blanked at the altar when it came time to give me away, and Rev. Schulte, with barely even a blink, very calmly walked him through it. We also loved loved loved his seersucker suit, which was perfect for our outdoor ceremony! We feel very lucky to have had him officiate for us – he really worked hard to give us a perfect day. We can’t thank him enough, and hope he takes us up on our offer to visit us in NYC! People tell me it’s good to put up Thank You notes online. So, here’s two recent ones. first time on the day of our wedding, we’re just amazed at how well everything came together. We also love the pictures that you took. Thanks for making our day memorable! *I took photos of their 6:30am sunrise wedding with my iPad 2 and with their camera. The one above is with my iPad 2. Reverend Schulte is, beyond a shadow of a doubt, the best officiant for your Savannah wedding. 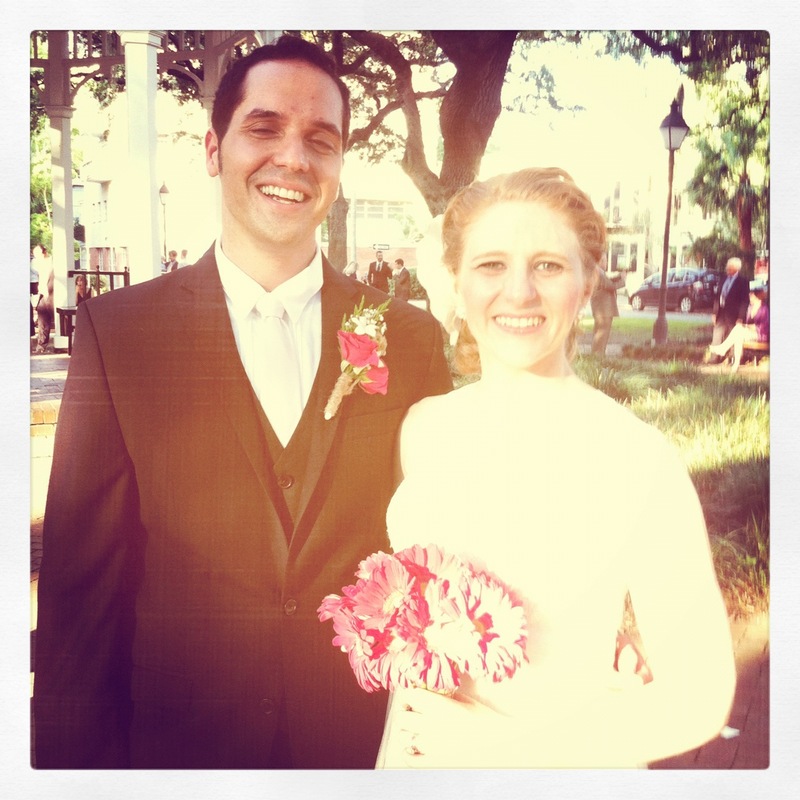 My name is Carin and my husband and I had the privilege of being married in April in Savannah by Reverend Schulte. We were fortunate enough to meet him and email with him alot before our destination wedding and this not only made us even more satisfied with having him preside over the wedding, but allowed us to call him a friend. We met with him in June to see if we wanted to choose him and after a great conversation and his honest thoughts and advice we booked him on the spot. Throughout the vow writing process he was available and helpful and knowledgeable. He not only gave great advice for the vows themselves but he dispenses invaluable knowledge culled from the tons of weddings he does do. He reminded me to think about the width of my stilettos since we were planning an outdoor ceremony and there would be grass to sink into; advised us to have laundered handkerchiefs for the ceremony (which most certainly came in hand! ); helped us come up with a rain plan and a entering and exiting the square plan. And, when we met him two days before the wedding, he went over every aspect of the ceremony, pronunciation of loved one’s names and suggested a way for us to have a few minutes alone as a couple right after the ceremony and prior to the photos to soak in “our day.” Reverend Schulte is thoughtful, extremely professional (he presided over the smoothest running and quickest rehearsal and managed to wrangle a bunch of chatty Brits and Americans with ease) and exactly the person you want marrying you on your wedding day.I can’t begin to express how pleased we both are with your participation in our big day. Performing a wedding ceremony is something that I love to do and I hope it shows. These thank you’s are one that I received via emails. Thank you for performing the ceremony for Steph and Ben. We so much enjoyed visiting your church and getting to know you a bit prior to the ceremony. We had a wonderful visit to South Carolina and are already planning a trip there in the near future. It is amazing that we were able to plan the whole trip and ceremony by Internet, and were so very happy with every detail. As Jared and I come upon our one year anniversary, we can’t help but think of you and your role in making our wedding day so very special. I think it’s only appropriate as we reflect on the last year to send you an update. 🙂 You remain a part of our lives whether you realize it or not. He was 7lbs 12oz and 21 inches long. 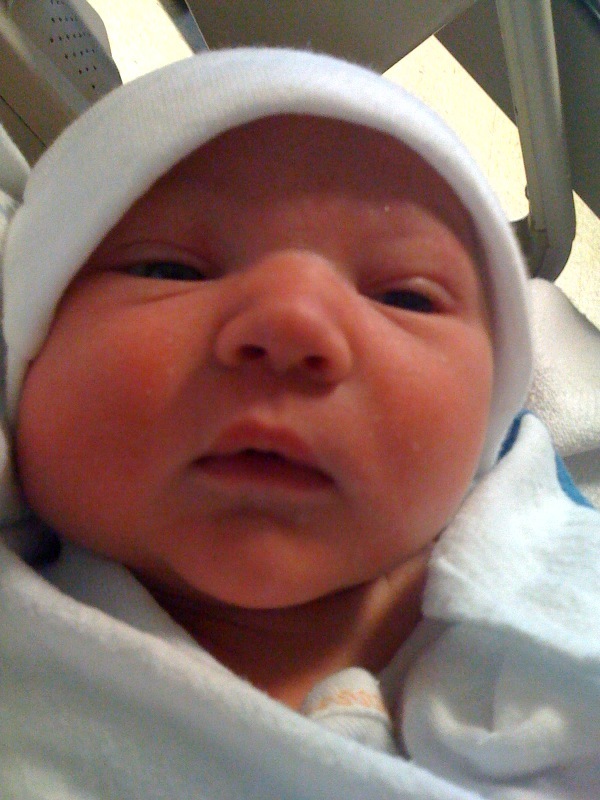 Eamon Christopher joined us on July 11 at 213pm. Since we last saw you, we have expanded our family. 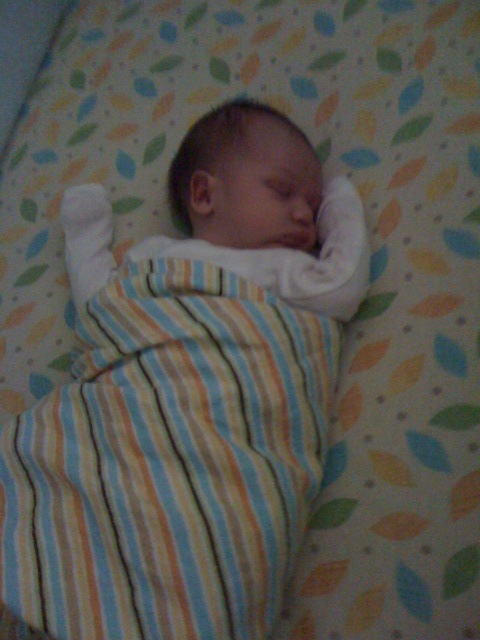 Eamon Christopher joined us on July 11 at 213pm. He was 7lbs 12oz and 21 inches long. That’s right, we sure did have a honeymoon baby! I have attached a couple of pictures for you. I still can’t thank you enough for making our day so special. We can’t wait to get back down to Savannah and when we do, rest assured, we’ll give you a call! Just wanted to drop a line to thank both you and Chad for making our wedding better than we could have hoped for. Everything just came together, even the weather. I need to get in touch with Chad regarding the photos. We are being bombarded with people requesting pics. Please have him contact us as to when we can expect to receive them. Once again thanks for everything, and we look forward to hearing from Chad. But you can still just call us Mike and Cindy. Thank you. We enjoyed it so much! We were happy to share our day with you. Thanks a million! I just wanted to thank you again for being apart of our son’s baptism. The service was perfect, just what we wanted. We loved your church! Thanks so much for being the biggest part of our wedding day! The ceremony was short and sweet – just what we wanted. We will forward photos when they are available.